Gary Bettman announced on Friday that the salary cap is expected to rise to roughly $71 million, and the Los Angeles Kings have plans and formulas in place should next year’s salary cap end up at $69M, $70M or $71M, amongst other landing spots. Some of the Kings’ formulas are based on the possibility that the NHLPA and NHL may agree to a partial 2.5% escalator of the salary cap, not the full five percent increase. This has been speculated in some circles, and while it is theoretically possible, it is unclear whether the NHLPA and NHL would reach such an agreement, and how such a decision would be implemented. For each League Year there shall be a “Lower Limit” and an “Upper Limit” at or between which each Club must have an Averaged Club Salary. The range between the Lower Limit and Upper Limit shall be known as the “Team Payroll Range” (the “Payroll Range” or “Range”). (Preliminary HRR for the prior League Year multiplied by fifty (50) percent (the Applicable Percentage), minus [-] Projected Benefits), divided [/] by the number of Clubs then playing in the NHL (e.g., 30), shall equal [=] the Midpoint of the Payroll Range (which figure shall be considered the Midpoint only for purposes of calculating the Adjusted Midpoint; all references to the “Midpoint” thereafter shall mean the “Adjusted Midpoint”), which shall be adjusted upward by a factor of five (5) percent in each League Year (yielding the \ Adjusted Midpoint, which shall then become the Midpoint of the Payroll Range) unless or until either party to this Agreement proposes a different growth factor based on actual revenue experience and/or projections, in which case the parties shall discuss and agree upon a new factor. This is ambiguous wording, and again, it is unclear whether the NHLPA would vote for a partial escalator, but from my conversations it is something that is being discussed as a possibility at this point. A 2.5% escalation of a $69M salary cap is $70.725M. Based on a report by Alex Prewitt of the Washington Post one day prior to Bettman’s announcement, Capitals General Manager Brian MacLellan told reporters that next year’s salary cap ceiling is expected to slot “somewhere between $70 and $71 million.” From my conversations with those in Los Angeles’ hockey operations, it is possible that the actual salary cap may not be revealed to teams until June 30, one day before free agency opens. Regardless of where the salary cap ends up, the Kings will have a variety of decisions to make during a period in which they aren’t particularly flexible financially. Los Angeles has roughly $64.15 million allotted to 17 players for the 2015-16 season, a figure that includes Slava Voynov’s contract (Los Angeles would have roughly $59.98M spent on 16 players if Voynov’s contract is not included). As for the immediate future, the Kings will open up discussions with restricted free agents Martin Jones and Tyler Toffoli now that both have returned from winning a gold medal with Team Canada at the World Championship. 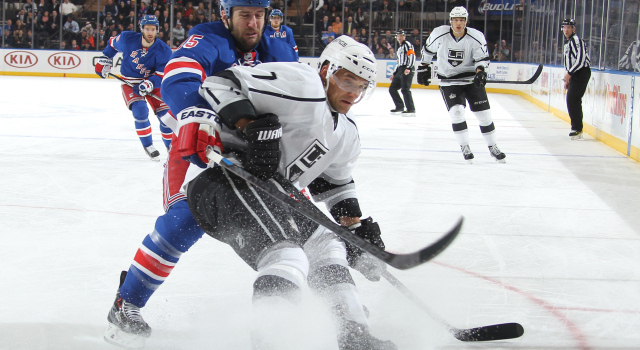 Expect both parties to hold discussions with the Kings this week. To continue the story I’ve reported on since the beginning of the off-season, the Kings and Jones aren’t far apart, and an agreement with the goaltender is expected to be finalized before a contract with Toffoli. As for Toffoli, there hasn’t been a bevy of discussion to this point, but what has been discussed lightly is whether it would be preferable on both sides to sign the 23-year-old to a bridge contract or a longer term deal. As for Andrej Sekera, no advanced negotiations have taken place since the preliminary discussions held last month established that there was mutual interest in the return of the soon-to-be 29-year-old unrestricted free agent. No hypothetical extension with Sekera is impending. Based on where the team ends up with Sekera will determine whether a decision is made to retain Jamie McBain. Team executives were happy with McBain’s contributions this past season, even though he played in only 26 games. Those I’ve spoken to were encouraged that McBain fully understood his role and didn’t complain or become high maintenance during the extended periods of time in which he was not in the lineup; they were also happy that at $550,000, he was very inexpensive. A reminder: salaries under $950,000 do not count against the cap while they are in the American Hockey League. More to come on Jones, Toffoli, Sekera and the salary cap will follow in the coming weeks.